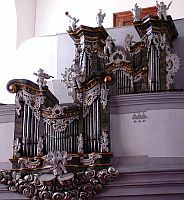 The instrument of Georg Tauchmann (1626-1674) is located in the chapel of the castle Hruby Rohozec. Hruby Rohozec is a small village in the Turnov region, about 100 km north-east of Prague. As the chapel itself was built in 1675, it is probable that the instrument was acquired together with the other furniture at this time. However, Georg Tauchmann died one year before the work was finished and so, it is not exactly clear who has completed the organ after his death. At that time the instrument had a single manual, probably without a pedal. We admire today the timbre of the stops. Signs of the historicity of the instrument, so called "expressive chiff" of the pipes when they begin to speak, is hardly to be heard anywhere else. Historicke varhany v Cechach. Praha: Libri, 2000. Jan Tomicek: Varhany v hornim Pojizeri. Zeleznobrodsko a Turnovsko. In: Z Ceskeho raje a Podkrkonosi, 6 (1993), p. 19-35.